EVER WONDER WHY MORE PROS IN THE NFL ARE TURNING TO THIS HELMET? The Schutt AIR XP(TM) packs the world's most advanced cushioning system, Thermoplastic Urethane Cushioning(TM) into the classic shell many players prefer. TPU takes protection to the next level by incorporating a new 3-dimensional form which allows it to conform to the shell more closely, virtually eliminating a break in period. TPU contains more hemisphere which means the protection is even BETTER than before. TPU does not break down like traditional foam, even after thousands of impacts. TPU is resistant to bacteria, mold and mildew. 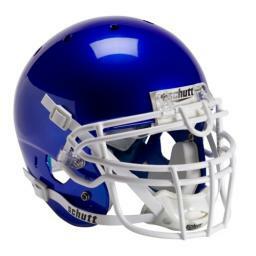 This offers the traditional shell helmet with that familiar, spherical shape that so many players have grown up with. A unique combination of tradition with state-of-the technology in a helmet that is small in appearance but packs the BIGGEST protection of any traditional shell helmet on the field. The SUREFIT(TM) Air Liner System features two parts: the lateral air liner and the crown air liner. Together, the two parts provide a complete custom fit and unsurpassed comfort. The Air XP is also treated with Ultra-Fresh(TM) anti microbial system. Meets NOCSAE standards.